re·gret (ri-ˈgret), v. –gret·ted, –gret·ting, –grets. –tr. 1. To feel sorry, disappointed, or distressed about. 2. To remember with a feeling of loss or sorrow; mourn. 3. regrets. A courteous expression of regret, esp. at having to decline an invitation. [ME regretten, to lament < OFr. Regreter : re-, re- + greter, to weep (perh. Of Gmc. Orig.) –re·gret·ter n.
The origins of the word regret mean “to lament” or “to weep.” There is a bitter taste that permeates regret. We want things to be other than they are. We feel loss. We wish we had behaved differently or tried harder or let go sooner. People often hand out the trite saying: you’ll regret the things you didn’t do in life more than the things you did. But I think there is plenty of room in Regretsville for them both. I also think, in this privileged land of choices, we spend too much time regretting or anticipating regretting the wrong things. 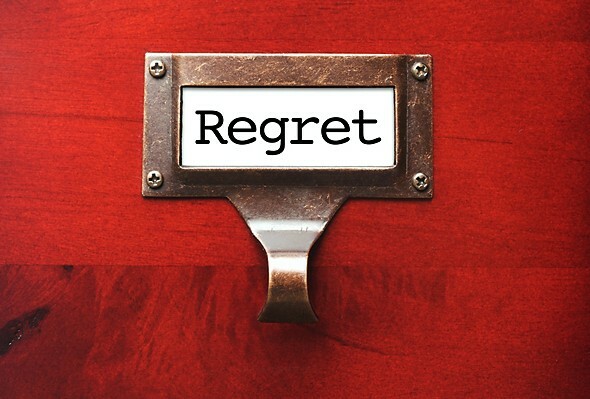 Some regrets mark a culture in which we are too scared to even be in touch with our deeper desires and regrets. Teenagers and young adults say FML when they have a challenging day, when they don’t get precisely what they want. Microsoft boss Steve Balmer said “his biggest regret” was missing out on the smartphone boom (This was incidentally, the first result when I searched for “my biggest regret” is). Saying one’s biggest regret is not getting in on an industry to make more money seems pretty silly in the grand scheme of things. But I think it is a helpful canary for a culture that is driven by accumulation of more and more wealth. Regret can also signify our desire for constant control of every aspect of our lives and our inability to recognized our own humanity. My mindfulness teacher once told me not to be too hard on myself about my actions in the past. “If you could have done something differently, something more skillfully, you would have,” he said. “That was the best you were capable of at the time. Regret as fuel for change and for acting better in the future seems productive. What doesn’t seem productive is using regret as a weapon against ourselves. Our today self decides that there was something that our years-ago self could have done so that we wouldn’t have regret. But our years-ago self wasn’t capable of more mature or wise action; that self hadn’t yet learned the lessons. Ultimately, what they seem to boil down to is one word: connection. Connection with ourselves and connection with others. Connection with ourselves allows room for us to become aware of how we want to use our gifts and our lives and to trust that over the feedback we get from socialization and expectations of others. Connection with others allows us to value relationships over work and to reach out and make ourselves vulnerable with the support of those we care about. Realizing our connection to everyone and everything allows us to get out of our selfish spin cycles of thought and into the world that we belong to. The Dalai Lama said, “The pain of regret didn’t go away. But I don’t let it pull me back and drag me down.” I don’t think it is possible to be human and not have regret. We will inevitably mess up. We will do things we wish we hadn’t done. We won’t do things we wish we had. But I think there is a healthy way to acknowledge our regrets without getting mired in them. Miring ourselves in regret is a trick. So long as we fixate ourselves on the past, we don’t have to be present right now. And right now is when we actually have some choice.